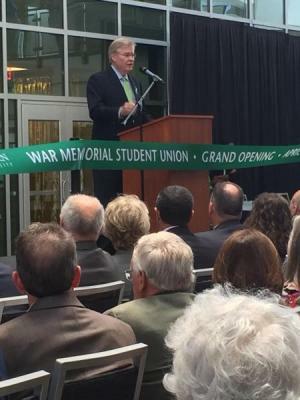 Recently, Southeastern Louisiana University officials, faculty, alumni and guests celebrated the official opening of the renovated and expanded War Memorial Student Union. Lincoln Builders of Baton Rouge had the privilege constructing this $32 million three-phase project. The Student Union was originally built at its current location in 1965 and underwent considerable renovation and expansion in 1983. The recent project saw approximately 90,000 square feet of existing space renovated and the addition of 90,000 square feet of new construction. The design merges the three different additions into a single unified landmark on the campus, with a vibrant translucent exterior that welcomes visitors and serves as the “front door” to the university. In addition to multiple dining options, the new building includes added retail, a bookstore, and other student lounging and meeting areas.